A recent trip to Scotland (1300 miles round trip) convinced me that the Ibex deserved some taller gearing. Currently running on smaller than usual tyres (32" instead of the 'standard' 33") means that 70mph is acheived at well over 3000rpm. This is pretty hard on the poor old 300Tdi, which red-lines at 4K, not to mention the ears of the occupants. Taller transfer box gears. The LT230 transfer box is fitted with 1:1.410 ratio output gear (in high range). It is possible to fit another of the other common Land Rover ratios. A 1:1.222 gear would result is around 15% taller gearing, or a 1:1.003 gear would give 40% taller gearing. Larger tyres. 'Standard' tyre for a roadgoing Ibex is BFGoodrich MT in either 285/75R16 or 255/85R16 sizes. My truck is currently running on 265/75R16 (due to balance problems on my 'normal' wheels). Taller tyres obviously result in higher road speed at a given engine speed. Overdrive. An overdrive gearbox makes use of the PTO mounting on the rear of the transfer gearbox, and is effectively a complete additional gearbox between main and transfer 'boxes. I intend in the long term to switch back to the taller tyres on the Ibex, but lack of time and indecision over wheel type have prevented me from doing so before now. In addition, the currently fitted tyres are brand new and so are the wheels they are mounted on, and replacing them would be a significant investment. The taller of the options is 255/85R16, which result in a 33.3" rolling diameter (according to BFGoodrichtires.com) which is a paltry 4.4% improvement over the current gearing with 265/75R16 fitted. This would reduce the engine speed by less than 150rpm, not enough to make a serious difference. Changing transfer gear ratios seems initally to be the best option. It is possible to fit the 'Q' series gears developed for the Discovery II which are designed to be quieter than the standard ones, and give a 15% gearing hike at the same time. 15% seems the maximum that one would want to change the gearing for a 'full time' setup, as even with a good strong feeling Tdi like mine the blunted performance through the gears might be more noticeable than desired. However, 15% would still give a cruising engine speed of around 2800rpm. Both units offer a 28% increase in gearing, which results in a cruising rpm much lower than the Q series gear, while not suffering it's big disadvantage. Since the change is not full time, a taller gearing change can be accomodated easily without taking a hit in the 'through the gears' performance. I looked briefly at the Roverdrive unit, but discounted it because of its mechanical engagement method (i.e. extra gearstick). While in most Land Rovers I would consider this a good option, I was concerned over the details of adapting the arrangement to suit the Ibex somewhat different bodywork and chassis. While I found little anecdotal evidence on either device, the GKN seems to have a much larger market share, and in addition it is also available for other vehicles (Mitsu. L200 in particular). The shift on this unit is accomplished via a solenoid valve controlling internal oil flow, and an electronic module prevents operator abuse by operation in lower gears or at too low roadspeeds where torque loadings will be higher. Even with the GKN device, I was not 100% convinced that the overdrive would fit into the Ibex, due to the detail differences between Defender and Ibex bodies. Fitting the unit turned out to be very simple. The bearing support / PTO cover is removed and the input gear drawn out. The size and number of gear teeth is compared with the gear supplied with the GKN unit. GKN will supply the correct alternative gear by post if required - obvously they appreciate what all owners have always known, that there is no such thing as a standard Land Rover. All being well, the overdrive casing is split into two halves and the input gear assembly is fitted into the PTO housing, with supplied hardware and a smear of gasket sealant. The epicyclic gear assembly (the second half of the casing) is then bolted up, with additional sealant as required. The only LR related problem encountered was that the handbrake cable wants to occupy the space where the overdrive fits, and it is stiff and awkward to move it away. Typically this blocks the filler plug for the LT230 anyway, so it isn't a new problem and probably depends on the exact type of handbrake assembly fitted. Access to the upper bolts is very awkward on the Ibex, but this can hardly be blamed on GKN since the floor is removeable in a standard Land Rover. With the main body in place, it remains only to plumb the breather pipe, before turning to the electrics. I had to remote mount the breather oil catcher, but I assume this would not be required in a standard vehicle. The electrical setup consists of a speed sensor (screwed into the overdrive housing), a replacement gearknob (with warning light and operating switch), a small ECU module and a premade wiring loom. The only connections to the vehicle wiring are an ignition switched live, and a constant ground. 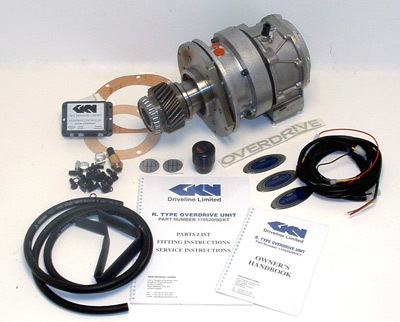 The GKN overdrive is often advertised as offering the split shifts between 3rd/4th and 4th/5th as mentioned above. However, in each case the split ratio is almost exactly the same as the next highest gear. i.e. 4th is the same as 3rd with O/D, 5th is the same as 4th with O/D. this means it's implied advantages for towing are not as good as one might believe. However, in this situation the full power gearshift is still very useful in keeping the acceleration going on hills etc. I've not owned the unit for long enough to comment on the proffered fuel savings yet, but I will update this section when I feel competent to do so. In the meantime, the two main advantages, a tall top gear and full power shifting, are real and worth having. Motorway cruising is now carried out at an indicated 2600rpm at around 70mph, and feels much more relaxed. The moment a steep incline starts to knock off momentum, the flick of a switch results in a smooth downshift to hold the speed, or to aid in overtaking. The top gear feels very tall, but not ridiculously so, with the Tdi pulling well down to around 200rpm. I find myself using O/D on shorter and shorter stretches of road as I get more used to its operation, though I am occasionally surprised by the automatic disengagement when the roadspeed drops low, and I am not paying close attention. This nicely avoids being caught in an unexpectedly high hear, and saves wear on the O/D unit at the same time. Update - I've been running with the overdrive now for approaching 2000 miles (3 weeks !) and I can make some comment on fuel economy. My daily drive is a 50/50 split between fast wide road and twisty single carraigeway with slow moving traffic. There seems to be a trend to slightly better fuel economy, but only in the region of 1mpg improvement. This doesn't seem like a massive improvement but it is around a 3.5% change. It is fair to say that the purchase cost will never be recouped on that basis alone, but reduce engine wear and cabin noise will go a long way to closing the gap.